Whether you’ve been on this journey for many years, or you’re just starting out, there’s a place for you. We welcome you to participate in whatever way that seems right to you. If these items don’t match your interest, please contact us! Donate — Become one of the many voices seeking to make a difference! Here is an annotated list of our valued partners, with links to their sites. Congregations all across the United States openly welcome gay, lesbian, bisexual and transgender people and their families. Here are lists of welcoming and affirming congregations. As an African American Christian, proudly rooted in the spiritual heritage of liberation and freedom, I am dedicated to the struggle for justice for all people, especially those on the margins of society…. Recognizing that we Black Christians are not of one mind but hold different opinions, biblical perspectives, and theological understandings… pledge to engage in respectful and loving dialogue…. Let’s face it: Many people associate Christianity with condemnation. 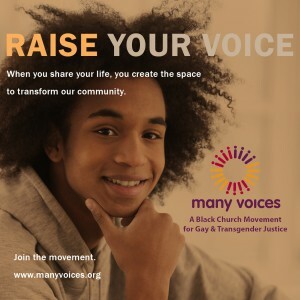 Even if you and/or your faith community welcome and include people on the full spectrum of sexual orientation and gender identity, many people will assume otherwise unless you say so.